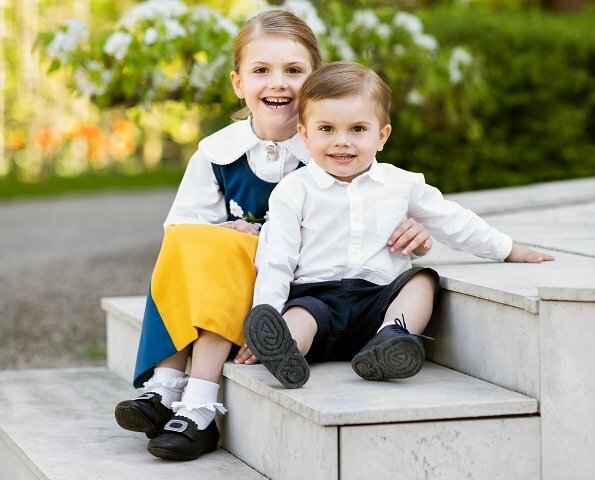 Princess Estelle and Prince Oscar of Sweden celebrated Sweden's 2018 National Day with a new photo. Swedish Royal Court released a new photo of Princess Estelle and Prince Oscar to mark Nationaldagen, the country’s national day. (The photo was taken by royal photographer Linda Broström at Haga Castle). Cute picture... but something bother me... Estelle has always her hair up... like her mom! She is a child for god sake victoria! How can you claim that people you don’t know are ”your life”? The poster gave their opinion, Jemma. Just because you don't like it doesn't mean your resort to preschool-like behavior. And just my two cents, if the couple "are my life", it is time to get some help. Seriously. Children with long hair don't always know how to keep it away from their face. Active children with long hair will probably get a lot of tangles in their hair. Stop critiquing a child's hair for goodness' sake. I must have been a very bad mom, my girls often had ponnytail or braids when they grew up. Kept the hair away from the face and less tangles + it looked good. It is typical portrait photography at it's best. The people are in the focus not the background. It is a fantastic photo, light, colour, focus, cut, expression of the two children. I like it that way. But maybe a matter of taste. Very cute children. But as allways only the female wear national outfits! Why? All children are special. But there is something about little Estelle ! She's little ray of sunshine. Prince Oscar, smiling is a joy ! This event is worth a little smile,at least for Oscar.Both children are very cute.Would be nice to see all 7 on one photo at least for National Day. Whenever I see pictures of these two cuties, I start to smile!